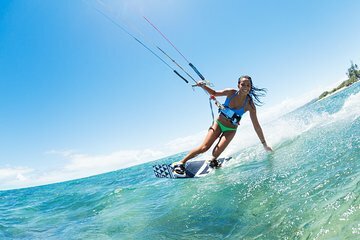 Learn to kitesurf during this semi-private lesson on Marigot Bay or Simpson Bay Lagoon in St Maarten. Follow the lead of your expert kitesurfing instructor as they teach you how to body drag, how to lift and steer a kite and how to stand on the board and fly over the azure ocean. Use of all equipment and overwater transportation to the lesson location are included in this 2.5-hour activity. Make your way to the jumping-off point for your kitesurfing lesson, near Marigot on the French side of St Maarten. Meet your expert instructor and hop in a speedboat for the quick ride out to the lesson location with one other person for this semi-private activity. Depending on the daily wind direction and weather conditions, you will either head out into Marigot Bay or to the calm waters of Simpson Bay Lagoon. Listen as your instructor gives you an orientation to the different pieces of equipment that are necessary for kite surfing and a short safety and etiquette lesson. Then, get fitted for a kite, board and harness, start learning the basics of the sport. Learn how to handle the kite, how to steer it, and how to body drag. Depending how that all goes, you may be ready to try and get up on the board for your first run. It's a tough sport, so don't be discouraged if you don't get it right away. At the conclusion of your 2-hour lesson, return to the surf shop and maybe sip a drink from the onsite bar (own expense).